I have always believed that true Winter conditions usually start after Christmas and last into late Feb.
with so many NAM's out there, we need to know if that's the over-hyper 3km or the parent 32km cuz it makes huge diff in this very marginal instance..
Edit - 32km looks to hit IA (and dare I say) SE Neb.. I've just started calling it the NAMily. Light rain falling here now associated with the northern piece of energy. Might change over to light snow or flurries tonight but the main precip associated with the southern piece will be well east southeast of here. Good luck to everyone with the precip and wind. Let’s hope the next storm thread is about snow. Rain, Rain, and Rain...still forecasted w this system in SEMI. Now, they are not mentioning at all about any mixing, not even snowshowers on the backend. Wow. Looks like the cold air will not get in on time. By the time it does, all the moisture will have left my area. Precipitation is stupid anyway. It's all dumb and wet. If you're like me, just start planning outdoor activities every day. Ended a six week drought in no time. Haven't gotten very many of the things done that I've needed to though the last few weeks. My word, that is a low ceiling out there. Just noticed we got some drizzle goin now too. Been very dreary looking all morning. Temp is only 36. Im having doubts on that forecasted 51. Once again....temps have come up short all week. We haven't hit a forecasted high at all this week. My forecast calls for Rain Saturday nite going ova to a few rainshowers b4 ending w possibly a passing flurry. They tend to change it up w different wording every so often. By tonite, they will prolly say rain ending as a few rainshowers or wet snowflakes. A teaser.....neva go w only 1 model run, unless, you have multiple models that are agreeing w one another for a good 2+ days in a row. These guys have gone with some back-end snows as well. They have a pretty good track record in my book, so this will be a good test if they're on their game for winter modes..
Increasing confidence of at least seeing my 1st legit flakes Sat night..
Lake effect snowbelts will most likely see snow from that cold air rushing in ova the lakes. Several inches w whiteout conditions and travel delays w reduced visibility can be expected. Who knows, maybe I will see a flake Sat nite into Sun. GGEM one of the strongest (and warmest go figure) models and wants to get this sub-980 just east of SMI. If correct, Niko's place should be quite windy! The hi-res NAM continues to be the most aggressive with the cold air on the back side and snow chances. Again 10:1 shown here for dramatic effect. Looking more and more like we may get our first measurable snow of the season tomorrow. Won't be much but with a rain-cooled ground and considering the fact that Wednesday was the average first measurable snowfall day for here, it'll work. Reports of hail in the south burbs of chi town? Impressive stuff for mid November. Pretty strong storm rolling through here - lots of rain - thunder - lightening. And those dynamics are just from that northern wave. Southern wave still preparing for launch.. If those negative 850's were lurking just a half state further south, this is a whole nother ball game! I think we're a go on snow early in the morning tomorrow. All the models that showed us as 100% rain (HRRR namely) have run up to 6 degrees warmer than what we are at now. HRRR had us at 56 at 8pm, it is 49.5 on my balcony now.Once we get the precip in to cool everything down further, including the grass, I think we can look at accumulating snow here. Omaha I'm not so sure about. Yup....winds are expected to be gusting to near 40-45mph w sustain winds 20-25mph. What beats 33-n-rain? 41-n-heavy rain! Happening here with thunder rumbles as well. Baro @ 29.69 in hg and dropping steadily. Wow, MI covered with radar returns. 996 mb closed contour in KS at 9 pm and Nebraska radar lighting up! GRR has upped my total qpf from .5-1" to 1-1.5"
Temps will rise tomorrow w rain and slowly dropping throughout the afternoon as temps fall into the 30s. Winds will start howling as colder air rushes in. Radar is socked w heavy rain coming my way. I am looking at at least 1.50"+. Its going to get wild....possible strong storms ahead of the CF during the pm hours. Snowshowers possible for my area w strong winds. 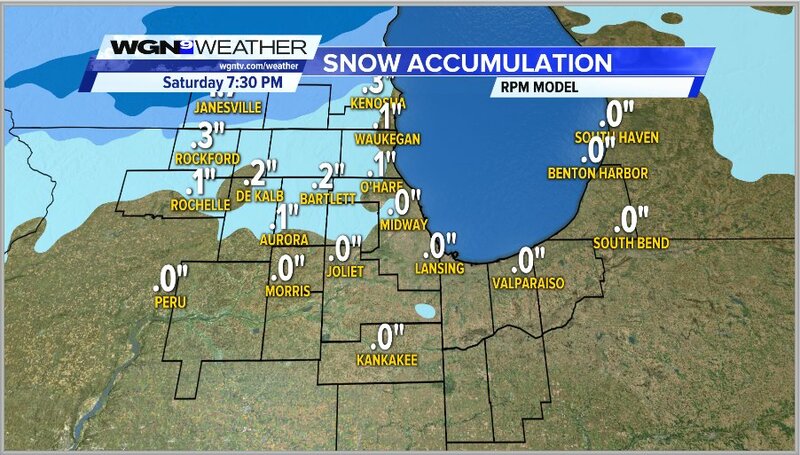 SWMI looking at some snowshowers likely Sat nite. Keep an eye on the radar tomorrow nite Jaster. Rain/Snow mix being reported in E IA/SW WI, hail reports south of Chicago near Peoria/C IL region along the warm front. Fascinating storm system intensifying as we speak. CF has pushed its way through the area and winds are becoming gusty. It's a raw, windy and wet morning out there today. Kinda gets you that sense this winter is about to come on hard. Madtown, are you getting snow? Radar looks like it should be mixing in. @ Jaster, doesn't this storm kinda remind you of the mid November storm back in 2013? Radar is really lighting up as SLP deepens. Perfect track for a "share the wealth" system in future cycles. Skilling talks about how this storm had the "Pineapple Express" connection. Talk about a juiced up storm! 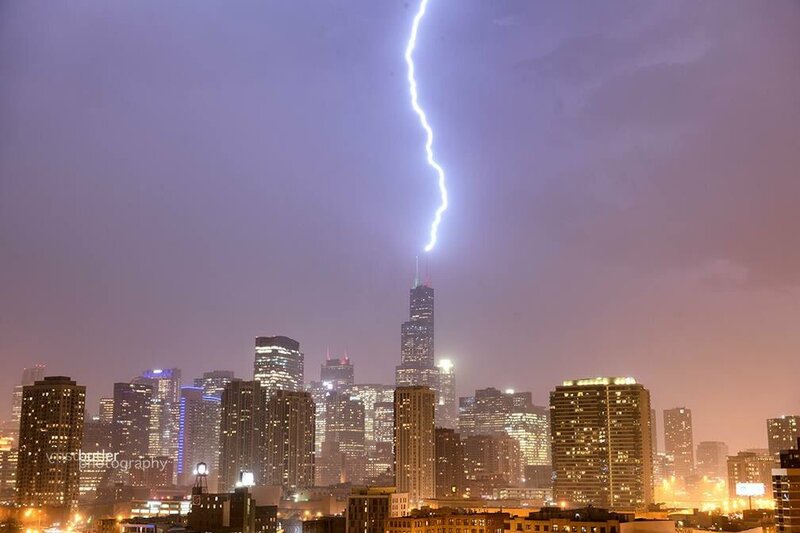 Friday night "strikes" over Chitown! "@ Jaster, doesn't this storm kinda remind you of the mid November storm back in 2013? Radar is really lighting up as SLP deepens. Perfect track for a "share the wealth" system in future cycles. Skilling talks about how this storm had the "Pineapple Express" connection. Talk about a juiced up storm!" Yeah Tom, here's our share the wealth sub-forum track alright! This would be a really sweet set-up when cold is entrenched. Ya, I can't remember TBH. The only thing I recall which stuck out was how d**n cold it got in mid December and our first sub zero readings were recorded around then. Prob makes sense we got a fresh snow cover during that period which allowed temps to tank. That was just the beginning of the "Polar Vortex" theme that year. I'm sure we will see a few visits this season, but I think we may beat some low temps reached that season around here partly due to the numerous HP's (post storm) we have seen this LRC. Lay down a deep snow pack and allow some massive HP's to slide in across the region and that will be the best scenario to get the coldest temps. Well, no snow. I'll take the heavy rain we had though. I think this is going to be the final storm to effect our area for the LRC's first cycle. Nice way to finish off the first cycle with a bang! Congrats to everyone who gets snow with this! Probably won't be many. Saw some video of the snow ripping near Dearfield, WI that whitened up the ground. Glad you guys scored some snow out of this to give you a "taste" of Winter. Loving this first legitimate snowfall of the season! Bring it on! Atmospheric Fireworks are exploding downstate...hearing reports of major turbulence from pilots flying over the storms farther south. Torrential rains, vivid lighting...this is what I'm talking about! Looks like most of the MKE area is seeing fatty flakes flying. Congrats! It rained a couple tenths, here. That's all. No flakes.